She has multiple complaints against her including that of dowry, sexual harrasment and allegedly driving a family of seven to suicide, But, look how Delhi cops are seen treating self-proclaimed godwoman Radhe Maa. 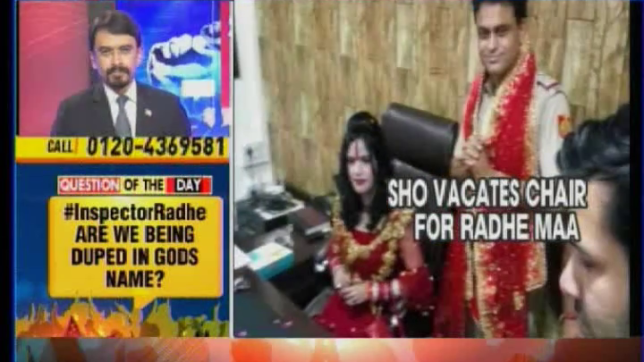 The Station House Officer of East Delhi’s Vivek Vihar Police Station is seen standing with hands folded in his own office while Radhe Maa occupies his chair. And If that wasn’t enough, Radhe Maa even went to the extent of dancing as cops around her sang praises. This VIP treatment was accorded to the controversial goadwoman when she visited the police station in connection with a dowry case. Following the uproar, Vivek Nagar SHO has been sent to district lines pending inquiry.